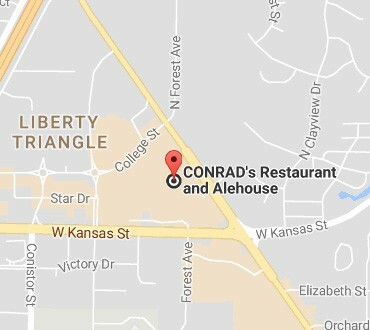 CONRAD’s Restaurant & Alehouse offers an amazing 42 Taps. Whether you are out with the family, getting together with friends, or just having a night out with that special someone, the variety and selection of beer is sure to impress. 42 Beers on TAP! Our focus is Regional and American Craft Beers. We rotate often. Ask your server or bartender for our Beer Menu. In addition, CONRAD’s offers a full selection of wines, Sangria, Alehouse Margaritas & Martinis Scotch, Whiskey-Bourbon, Tequila, Gin, Vodka and other premium spirits.